LIMITED EDITION POPPY PIN BADGE! LOOK OUT FOR THE LIMITED EDITION POPPY PIN BADGE! 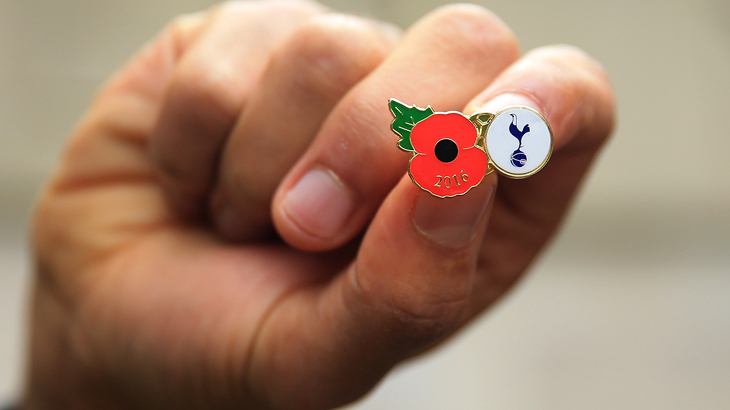 Tottenham Hotspur and Royal British Legion have jointly launched a limited edition Poppy pin badge to mark the Remembrance day. With a minimum of £3 donation, the pin badge will be available for fans to purchase. Funds raised from sale of the pin badges will be donated to the Royal British Legion. Tottenham Hotspur and Royal British Legion limited edition Poppy Pin Badge. The badge is testament to the strength of the on-going relationship between the Club and the Legion. It’s the UK’s leading Service charity, providing practical care, advice and support to serving members of the Armed Forces, veterans of all ages and their families. How are the Poppy Pin Badges made? Take a look at this interesting video to find out how poppy pin badges are made! Why do we wear Poppy Pin Badges? The poppy is a symbol of respect for those who have died during the First and World War II. It is also for those millions of people affected by war. Poppies are said to be the first flower to emerge from the freshly-dug graves of dead soldiers on Flanders Fields. Canadian Doctor John McCrae was the first person to notice. He went on to write the poem In Flanders Fields – recalling the scene. The poem inspired the use of silk poppies as a sign of remembrance. The poppies are now a symbol of remembrance and hope. When can you start wearing the Poppy Pin Badge? Poppies are sold from around October 23, 2016 but most people won’t start wearing it until October 31. It is believed that a poppy should be worn from 11 days before Remembrance Day. Others meanwhile say that a poppy shouldn’t be worn until after Bonfire Night and Halloween. Are you looking for personalised pin badges to promote your charity or business? We can help you! We, at i4c Publicity Ltd is one of the leading providers of high quality promotional merchandise such as custom badges, ties, key chains, medals, trolley coins, cufflinks, tie slides, embroidered badges, scarfs, pennants, fridge magnets, wristbands, shields, plaques, umbrellas and more! Please call us on 024 7666 7440 or email us for a no obligation FREE quote.